Navy Associate Athletic Director Scott Strasemeier said Friday that head football coach Ken Niumatalolo has not interviewed with Minnesota for their football coach opening. Rivals.com college football reporter Tom Dienhart wrote on his Twitter feed that a source told him Niumatalolo was a finalist for the Minnesota job after his interview. Strasemeier, however, said Minnesota had not asked permission from Navy to interview their coach per NCAA regulations. In fact, no other university has asked to speak with Niumatalolo. Not that Strasemeier doesn’t expect Navy’s coach to get attention from other schools at the end of the season. “This is what happens when you are successful,” Strasemeier said. 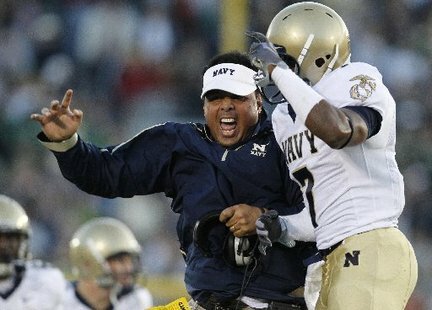 Niumatalolo took over the Navy football program after his predecessor, Paul Johnson, bolted for Georgia Tech before Navy’s 2007 bowl game. Then the offensive coordinator, Niumatalolo has since taken the reigns and Navy hasn’t skipped a beat, going to its third bowl game in his first three full years as head coach. Most importantly, he is 2-0 against Army.